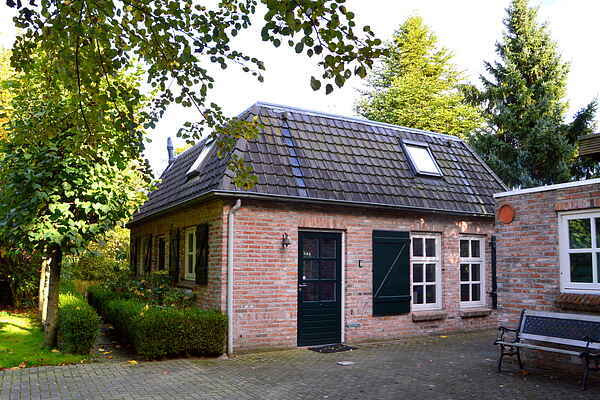 This distinctive holiday home is located in the outskirts of Haaren in Brabant. There are many recreation facilities nearby, like in the Oisterwijk area, the nature area "De Kampina" and the "Loonse en Drunense Duinen". You will find many beautiful walking and cycling routes here. We recommend a visit to the cosy Oisterwijk, with its many terraces and restaurants, or the capital of Brabant, Den Bosch, with its old and typical inner town. Fun excursions with the kids are : the Efteling (26 km) and the Beekse Bergen (18 km). At 6 km of the house you will enjoy the large recreational lake 'De IJzeren Man', where you can swim, water cycle, row and sail in summer. The area known as ‘De Noenes’, where the house is situated, lies at a distance of circa 3.5 km from the village centres of both Haaren and Helvoirt. In both locations there are a couple of supermarkets, a butcher, a baker’s, a doctor’s surgery etc. 7 km away lies the bustling village of Oisterwijk with interesting shops, cafes and restaurants. In a short time by car you are in ‘s-Hertogenbosch with its’ old and atmospheric city centre, in Tilburg where at the end of July the largest fair in the Benelux takes place, or in Eindhoven or Breda. By train, from the railwaystation of ‘s-Hertogenbosch, it takes you half an hour to Utrecht and 1 hour to Amsterdam. Other interesting cities in the Netherlands are the Hague, Gouda, Delft and Maestricht. All these cities are to be reached in 1 to 1 ½ hour by car. In one hour you are also in Antwerp in Belgium (the Bird Market on a Sunday morning is recommended!) and the Belgian capital of Brussels is circa a 1½ hour drive and is also easily manageable as a daytrip. In Oisterwijk and Vught there are train stations with car parking facilities. Between Helvoirt and Haaren, about 2 km from ‘De Noenes’, is a bus stop for the Veolia Transport line 140 which links the train stations of Tilburg and ‘s Hertogenbosch. Eindhoven Airport, one of RyanAir's popular destinations, is only 30 km from Haaren and Amsterdam- Schiphol Airport is circa 100 km away. There is a direct train connection between ‘s-Hertogenbosch and Schiphol Airport (travel time 1:06 hr). You will not be at a loss of things to do in the surroundings of Haaren. There are diverse recreation possibilities in the immediate area. In ‘De Noenes’ itself there is a friendly coffee and teahouse. There are splendid walks and cycle trips to be made in the Oisterwijk Fens, the Kampina nature reserve and the Loonse and Drunense dunes. In Oisterwijk and in the Loonse and Drunense dunes it is possible to rent bicycles. Addresses of bicycle hire locations and walking and cycling maps are to be found in the house. The village of Oisterwijk is 7 km away with its unusual, small-scale boutiques, sociable cafes and a wide choice of restaurants. An absolute must! Trips with children can, amongst others, be made to amusement parks such as ‘De Efteling’ (26 km - www.efteling.com) and ‘De Beekse Bergen’ (18 km - www.beeksebergen.nl), the Prehistory Museum in Boxtel (8 km) or the family park ‘Dippie Doe’ in Best (20 km). In the summertime it is possible to swim, row, waterbike and sail at ‘De IIzeren Man’ in Vught (6 km). Moreover, in the beach pool of ‘De IJzeren Man’ there is a playground and a midget golf course. If it has frozen over it is possible to skate at ‘De IJzeren Man’. In ‘s-Hertogenbosch there is a tropical swimming paradise in the ‘Sportiom’ (18 km), with indoor and outdoor pools which are open the whole year round. In Vught the sports centre ‘Ouwerkerk’ with a fitness centre and indoor swimming pool is also open the whole year. It is a little further to the sea, but the beaches of Zeeland are well-suited for a day trip (www.vvvzeeland.nl/en/). On Wednesdays mornings and Saturdays in ‘s-Hertogenbosch there is a large market with more than 100 stalls. On Friday mornings there is also a (smaller) organic market. On Thursdays there is a market in Oisterwijk and in Haaren itself there is a small market on Thursday mornings. In season, in the immediate surroundings, you can buy produce such as asparagus (April until June) and strawberries (until mid-August) directly from the farms. ... and should you have no desire to set foot out of your domain, it is lovely to relax in your own large garden and to enjoy the stylish comfort within!